Sport Court of Southern California: Get Excited About Practice from Home! Get Excited About Practice from Home! Are you tired of waking your kids up for 7 a.m. practices or those nightly drives to and from team practices? Sport Court has a solution. Install a game court in your very own backyard and host practice anytime! 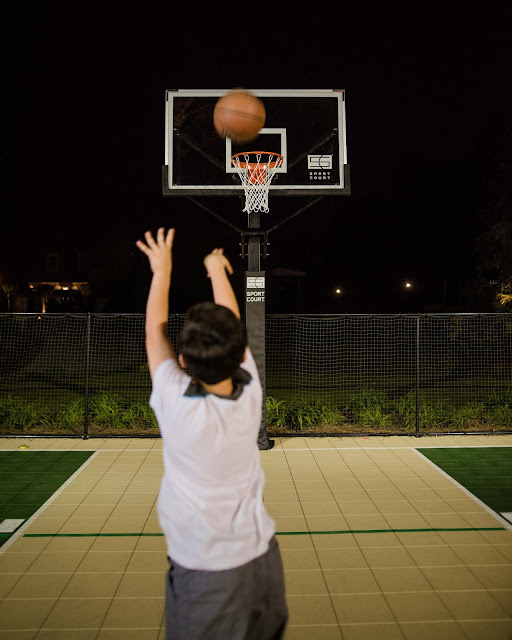 You won't have to worry about keeping a schedule or making sure you leave the house on time when you have a personalized court at home. Is your child a die hard Clippers or Dodgers fan? You can customize your game court using Sport Court Court Builder tool and our in house designers. We can help you choose how to represent their favorite team with the colors on the court or even their custom logo. You can feature multiple sports or even include a batting cage to help them perfect their stance like All-Stars Justin Turner and Corey Seager. Help give them the court and tools that will inspire them to work as hard as their heroes. Are you worried that your child will launch the ball into the next door neighbor's yard? Sport Court also offers a quick fix by adding a ball containment net around your game court. Ball containment systems are customized to every court and offer a durable solution to keeping the game in your backyard. Our systems are long lasting, can endure any climate and aggressive play. Keep practice open all day long for your champions with a game court from Sport Court. Healthy Snacks to Keep Your Game Going!